Monday June 10th was Big Brother Media Day. If you dont know what Media Day is, Media Day is when a group of journalists, reporters, and members of the press enter the Big Brother house and play a mini mock setup of the game for the day. The press then write/talk about their experience in the house to help promote the premiere. Media Day usually brings us house photos. Some of the media members include Matt Whitfield of Yahoo! TV and Watch What Crappens, and People Magazine's Patrick Gomez. Also in attendance was BB Canada winner Jillian MacLaughlin for ET Canada. During Wednesdays 'Talk Live Chat' a Fan asked Julie if she had "Any juicy hints or teasers for the upcoming season?" Julie responded, saying "The twist make it a no-floater summer!" What do you think it means?! CBS launched the live feed interface Tuesday! You can now sign in and watch past season highlights hosted by BB Alum Jeff Schroeder. Jeff will also host a Live weekly talk show on Fridays. You can also now sign in and chat will fellow fans. Speaking of Live Feeds. TVGN also announced that the first week of Big Brother After Dark will air commercial free. Also an executive of TVGN recently said in a interview that their will virtually be no difference in the content that will be shown on BBAD from its past home station of Shotime 2. The ladies are at it again! For the 3rd season in a row the ladies of 'The Talk' will enter the house and play a mini mock game for the day. 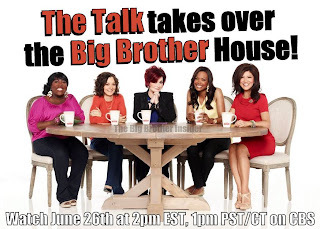 Now this segment has already been filmed but you can Tune-In June 26th at 2pm EST or 1pm PST/CT to watch the ladies cast their vote to evict LIVE! We will be watching, Will you? We know that the Media has a gag order in place until Friday June 21st. So we wont get any Media Day content until then but we can expect possible leaks...such as House Photos. Also House Photos have always, in the past, been released before the Cast Reveal. June 10th - 14th -- Houseguests and Alternates are being Kidnapped and Intros Filmed. June 21st* -- House Photos released through Matt of Yahoo! TV at Midnight. June 22nd* -- Houseguests Enter BB15 House. We will continue to update as things change. This season is the worst ever so boring! They to vote each Helen out lol and Aaron who is so rude and disrespectful to others! I blame her parents who raise her bc they did a horrible job!